At the Y, we believe all children should have the chance to learn healthy lifestyles, grow in leadership skills, and thrive among their peers. Our Youth Sports program approaches that belief in three ways. We teach and strengthen the skills of every child for the sports they love to play. We instill and develop the YMCA character values of Caring, Honesty, Respect, and Responsibility through key elements such as teamwork and good sportsmanship. We ensure that every child enjoys the time they spend in our programming by making friends and having fun. 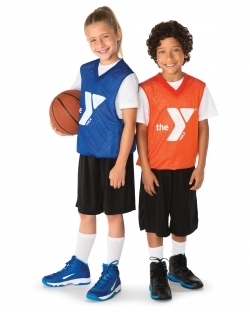 The West Cook YMCA offers exciting sports programs. Whether its gaining the confidence that comes with learning a new sport or building the positive relationships that lead to good sportsmanship and teamwork or learning new skills, participating in sports at the Y is about building the whole athlete, inside and out. Selecting a sport program to participate can be as simple as selecting one you or your child have enjoyed. However, sometimes it makes sense to think through your/your child’s fitness goals and what you enjoy doing. Sports offer the opportunity to participate individually or as a team, and challenges participants in different ways through endurance, speed, mental toughness, teamwork, strength and coordination. Shoot and score with Biddy Ball for your child. This program is designed to teach the basketball basics of passing, dribbling, shooting, defense and teamwork in a fun and entertaining instructional class setting. Sign up and enjoy your future star as they develop their basketball skills while taking their interest and game the next level. Little kickers is a beginner soccer program for ages 3-8. Our instructors will teach your child the basic skills of soccer, including passing, dribbling, and agility all through fun games and supervised play. This class is full of games and activities catered to help your 3-5 year old child develop the necessary balance, movement, hand-eye-foot coordination, and team building skills to succeed in youth sports. Sports include T-Ball, Kickball, Soccer, Floor Hockey and Basketball. This class is full of games and activities catered to help your child develop the necessary balance, movement, hand-eye-foot coordination, and team building skills to succeed in youth sports. Sports include Dodgeball, Football, T-Ball, Floor Hockey and Basketball. Families and children will learn and play a variety of sports, which include basketball, kickball, T-ball, floor hockey, soccer, etc. Please register the child for the class and the 1-2 adults who would be attending (already included in the fee). Build on fundamental skills through high intensity, challenging drills for intermediate to elite athletes to take their game to the next level. Skills include game time situations, making moves off the dribble, and finishing at the basket. Youth participants will focus on improving passing, dribbling and shooting skills. Teens should also check our Adult Sports for more programs.